Congratulations to Ben Lamb, Winner of Event #42: $10,000 Pot-Limit Omaha Championship ($814,436)! Ben Lamb wins Event #42! Boom! Ship it to Ben Lamb, winner of Event #42: $10,000 Pot-Limit Omaha Championship, a whopping $814,436 and his first-ever World Series of Poker gold bracelet! The field size in this championship event was 361 players and coming into Day 3, Ben Lamb was on the top of the pack with 38 players remaining. The money bubble was set at 36, which meant everyone was in for a long Day 3. After ten levels of play on Sunday, the returning field was whittled down to just four players and again it was Lamb on top of the pack. From there, Lamb was able to maneuver himself to victory and take down the title. First, Lamb was able to eliminate Christopher King in fourth place. Lamb was able to flop a flush on King's aces and hold from there after all of the money went in preflop. King earned $273,575 for his finish while Lamb extended his lead even more. 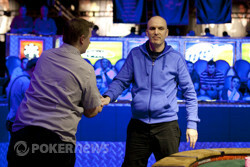 The aggressive Finn Sami Kelopuro was then able to find a double through John Shipley when three-handed. After doubling through the Brit, Kelopuro then eliminated Shipley shortly thereafter. Shipley took home $369,575 for his finish and the heads-up battle was set between Kelopuro and Lamb. 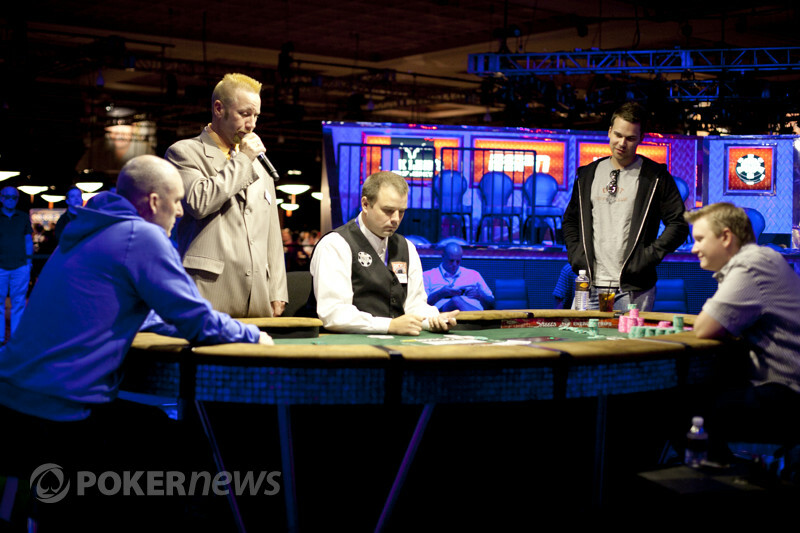 When heads-up play began, Lamb held the lead with 6.65 million in chips to Kelopuro's 4.18 million. Right away, Lamb was able to extend his lead and move over seven million in chips. From there, Kelopuro battled back to nearly even. He then took the lead from Lamb, but not by much as the two were virtually deadlocked. Lamb rebounded well and stole the lead right back before the final hand came up. Kelopuro held the and Lamb the on the board when all of the money went in. The river completed the board with the and gave Lamb a straight to win the tournament. Kelopuro was eliminated in second place for $503,173. 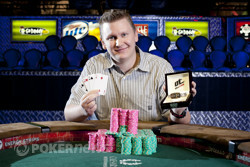 Congratulations to all of the winners and especially to Ben Lamb for taking down Event #42 here at the 2011 WSOP! Be sure to stay tuned to PokerNews for all of our continuing coverage of the Series straight from the floor and thanks for following along in this one. Ben Lamb completes his quest. Sami Kelopuro opened to 240,000 on the button and Ben Lamb defended his big blind. The flop came down and Lamb check-called a bet of 275,000. The hit the turn and Lamb checked again. Kelopuro fired 675,000, to which Lamb responded by raising the pot. Kelopuro took a deep breath before re-raising all in, getting a quick call from Lamb. Kelopuro, with top two pair, had a lot of outs to fade as Lamb held massive draws to a wheel and a flush. He got there with a wheel on the river when the fell, eliminating Kelopuro in second place. Ben Lamb raised with the button, Sami Kelopuro called, and the flop came down . Both players checked. The two checked again after the turned, and Kelopuro knuckled a third time when the fell on the river. Lamb tossed out 300,000, and Kelopuro called. Lamb fanned for kings and jacks, Kelopuro mucked, and Lamb retook the chip lead. Sami Kelopuro had the button and opened to 200,000. Ben Lamb defended, and the flop fell . Both players checked. Lamb check-called 250,000 from Kelopuro when the turned, and check-folded after the hit the river. Ben Lamb had the button and raised to 230,000. 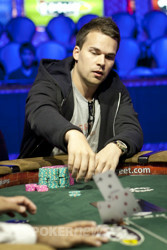 Sami Kelopuro defended his big blind, and the flop fell . Both players checked. The turn was the , and Kelopuro led for 275,000. Lamb called. The river was the , Kelopuro led again - this time for 745,000 - and Lamb again called. Kelopuro tabled for the wheel, and won the pot. Sami Kelopuro had the button and raised to 200,000. Ben Lamb defended his big blind, and the flop came down . Lamb checked, Kelopuro tossed out 225,000, and Lamb check-raised to 600,000. Kelopuro folded, and Lamb took down the pot. Sami Kelopuro opened to 200,000 on the button, Ben Lamb folded from the small blind, and John Shipley pushed his entire stack forward from the big blind. The bet was too much however - he was only allowed to raise to 650,000 - but Kelopuro instantly re-potted, and Shipley called. The dealer fanned , giving Kelopuro a leading pair of queens. Shipley needed help, and the on the turn only made things worse - it gave Kelopuro a redraw to a flush, taking away outs from Shipley. The bricked on the river, eliminating Shipley from the tournament in 3rd place. He stood up to shake his opponent's hands, and is off to the cage to collect some cash - $369,575 to be exact.